- Thus We should make preparations for Jummah from Thursday night, (which is Friday night islamically because is Islam we start with Night and end with the day until the followng night-Maghrib) The person who will receive the most benefit on Friday will be that person who waits for it and makes preparations for it from Thursday. 6. The Day of Qiyamah-Resurrection will be on a Friday. It is on this day that the Trumpet will be blown on Friday; There is neither any angels nearest to Allah nor any heaven nor the earth nor the wind and a sea but all of them fear the Day of Jummah,that is why everything in the heavens and the earth including God's most favourite angels and mountains, rivers etc. stand in awe of Friday. Its called jumm'ah because sayyiduna Adam alayhis salaam was put togehter on this day, meaning its the day he was born-This Milad. So whoever performs the Jumm'ah salah is actually celebrating Eid Meelid un nabi of sayyiduna Adam alayhis salaam. And "O Muslims! Allah Ta'ala has made this day (Friday) a day of 'Eid'. So have a bath on this day, whoever has perfume should apply it, and use the miswaak." (Ibn Majah). The point now to those who object to Eid Milad-un-nabi of the Sayyid of the Children of Adam, Sayyiduna Muhammad sallallahu alayhi wa sallam, is simple either stop praying Jumm'ah which is Kufr or either be quiet with your Munafiq-hypocritical behaviour and please learn your Deen correctly or celebrate the Milad un-nabi of Sayyiduna Muhammad sallallahu alayhi wa sallam which is the day he was born and is the greatest of all days. 8. In certain aspects the rank of the night of jumu'ah is even higher than Laylatul Qadr. The birds and insects meet with one another on Friday and say "peace be upon you , may it be a good day". 11. Rasulullah's sallallahu alayhi wa sallam appearance in this world was a cause of so much good and blessings both in this world and in the hereafter that they cannot be enumerated. 13. Rasulullah sallallahu alayhi wa sallam said: Of all the days, Friday is the most virtuous. It is on this day that the trumpet will be blown. Send abundant durood upon me on Fridays because they are presented to me on that day." 15. The word "shaahid" appears in Surah Burooj. Allah Ta'ala has taken an oath of that day. He says in the Quran: "By the sky in which there are constellations. By the promised day (of judgement). By the day that witnesses (Friday), and the day that is witnessed (day of Arafah)." 18. "The best day on which the sun has risen is Friday. On that day Adam was created, he was admitted to Jannah, and he was expelled therefrom.''[Muslim]. 24. The following verse : "This day, I have completed your Deen for you." A Jew was sitting near him. On hearing this verse being recited he remarked : "If this verse was revealed to us, we would have celebrated that day as a day of eid." Ibne Abbas radiallahu anhu replied : "This verse was revealed on two eids, i.e. on the day of jumu'ah and the day of arafah." In other words, what is the need for us to make that day into a day of eid when it was already a day of two eids? One should understand jumm'ah is a day of Eid and so take a bath be neat and tidy, trim your hair or nails and apply perfume and deodorant and also wear a Turban. 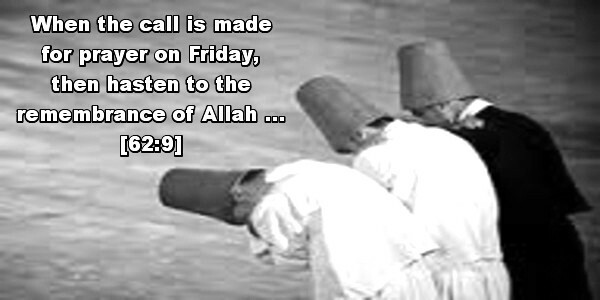 A tadition says "The Angels invoke blessings upon those who wear a turban on Friday". "One's deeds are shown to Allah on Monday and Thursday, and they are shown to Prophets as well as fathers and mothers on Fridays, at which time they rejoice for the good deeds, and the latter increase the brightness and light of their faces. Therefore be wary of Allah and do not harm your dead." Allah gives the person who recites the above 3 Surahs, protection from evil till the next Jum'ah. Subhaan Allaahil 'Azeemi Wa Bihamdihee . . .100 times. It is in accordance with the Sunnah to recite Surah Al-Jum'ah (62) and Al-Munafiqun (62), or Surah Al-A'ala (87) and Al-Ghashiyah (88) in the Friday Prayer. "O Allah bless Muhammad, the unlettered Prophet, and his family and grant them best of peace." Jum'ah is obligatory for every Muslim, except the slave, the woman, the child and the sick. "The name of the person who abandons the Friday Salaat without a genuine reason, will be recorded as a hypocrite in the Book (the Preserved Tablet), whose writings can neither be scraped out nor tampered with.